Jeff Bezos net worth: Amazon mogul set to divorce wife of 25 years – what could she get? Twitter has been mocking Amazon boss Jeff Bezos after the steamy text messages he sent to a married TV anchor were made public following news of his divorce. 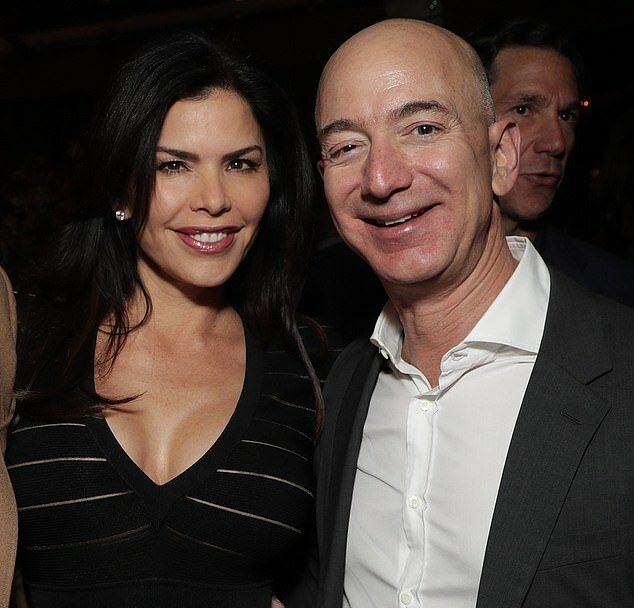 The texts, which were published by the National Enquirer on Thursday, were sent to Lauren Sanchez in the months before Bezos publicly announced he was splitting from his wife MacKenzie. 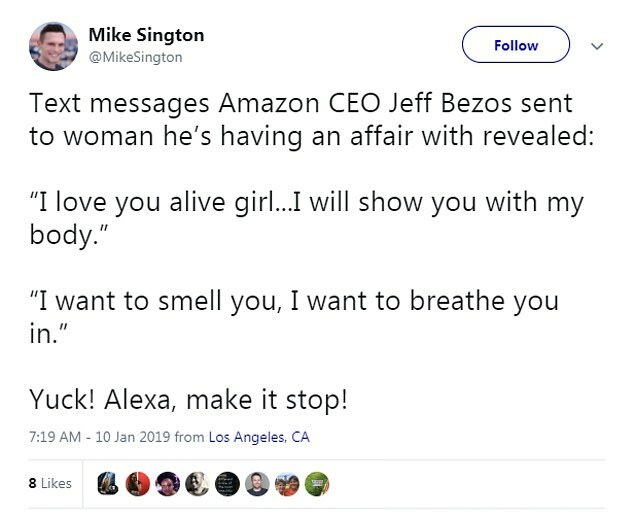 ‘I love you, alive girl,’ Bezos wrote to Sanchez in one text. In the others, the billionaire said: ‘I want to smell you’, ‘I want to breathe you in’ and ‘I will show you with my body, and my lips and my eyes, very soon’. 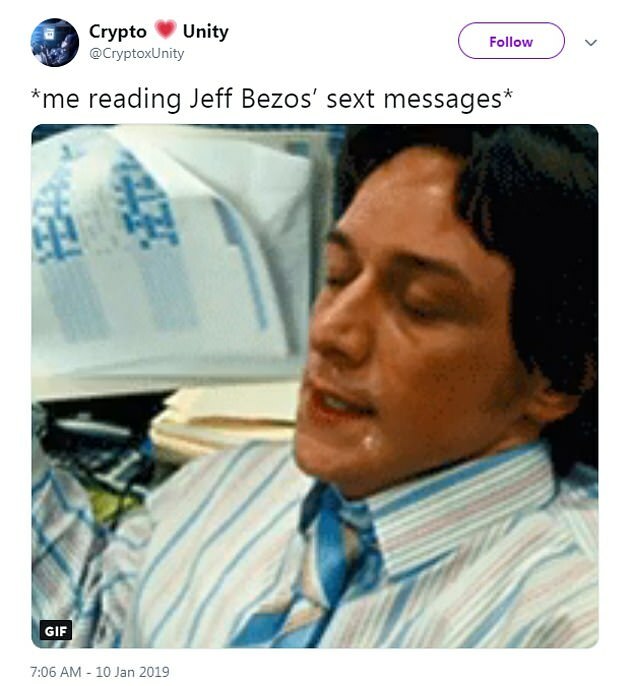 The messages sent Twitter users into overdrive regarding the Amazon founder’s sexting abilities. ‘Yuck! Alexa, make it stop!’ one tweet read. ‘Someone needs to build an echo add on that can teach Bezos how to sext,’ another Twitter user wrote. 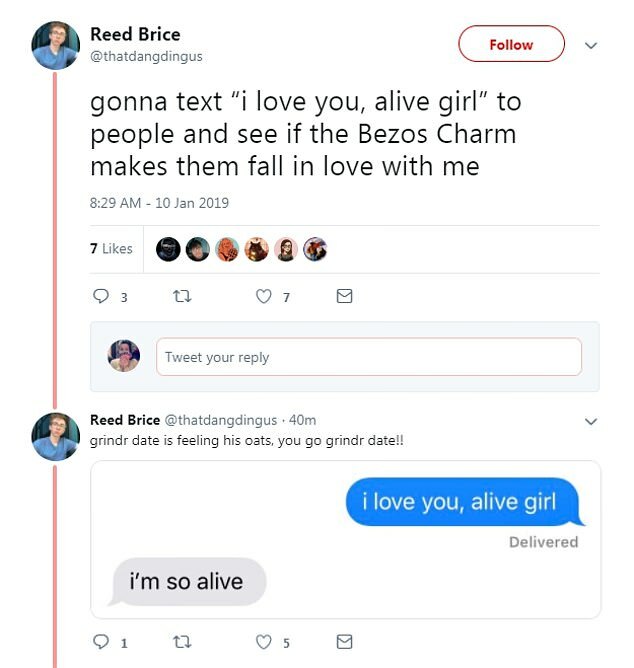 ‘I love you, alive girl’ uhhh… Is Bezos a Russian Twitter Bot? Yikes,’ a tweet read. The texts emerged one day after Bezos and his wife of 25 years revealed they were splitting. Bezos and Sanchez have both denied cheating on their spouses after their relationship was revealed on Wednesday night. The pair started dating in June before she separated from her Hollywood agent husband Patrick Whitesell. The National Enquirer claims they were having an affair behind their spouses’ backs.